March 22, 2014 June 2, 2016 LionAroundWritingLeave a Comment on Baby Face? 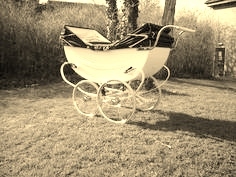 I CROUCHED DOWN looking into the black pram which sat alone without mother: an expectant expression unfurling on my face, best described as a diet smile. The way the sunlight shone meant my vision was hampered. My squinting eyes traced back and forth trying to spot the chubby white over-sized head in the depths. Peering closer, I could make out only a darkness where the head ought to be, poking out of the nylon warmth, the end of the blankets blackened. “Isn’t it beautiful?” prompted a voice above me. Whatever it was, it had a shadow darker than my own. I craned my neck. I struggled to hide my horror, and to find another smile to use to hide the emotion. My eyes made contact above the hood of the pram. Aghast, I nearly lost my balance. Like mother, like ‘it’. A genetic likeness of black nothingness was all I could see. They did not belong here. Or anywhere else. What kind of mother left their baby like this? I thought to myself, in my own mind as if that were the most pressing issue. Although the hideous answer towered above me, these sorts of rhetorical questions burrow their way to the surface regardless. ‘A mother like me!’ she snarled from no semblance of a mouth.